Go-karting is a fun experience. It will not only allow you to enjoy your time, but it’s also a great recreational activity for the family. However, not all off-road go-karts are made equally. Hence, to make the most out of it, you need to choose the best off-road go-kart. Allow us to introduce the top ten best off-road go-karts for this year 2018. Hopefully, this guide can help you make the right decision of choosing the go-kart for you. 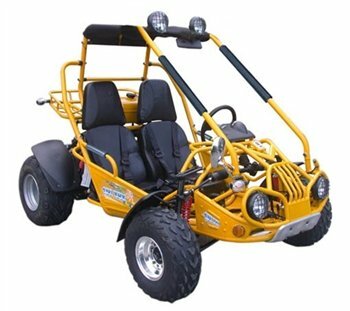 The first on the list is a product from Coleman company, the off-road go-kart with a 196cc engine 6.5 horsepower for great go-karting all day. This tandem off-road go-kart utilizes modern technology to ease the user. The durability of this off-road go-kart is worth taking note. Aside from that, the bolstered seat is equipped with a four-point safety harness. In that way, the user riding the go-kart is safe all the time. It also features a heavy-duty padded roll to maximize the security of the user. A kill-switch to turn the kart on and off anytime you want. This Coleman go-kart is made to last for an extended period. Huge tires, heavy-duty roll cage, and maximum capacity of 400 lbs. 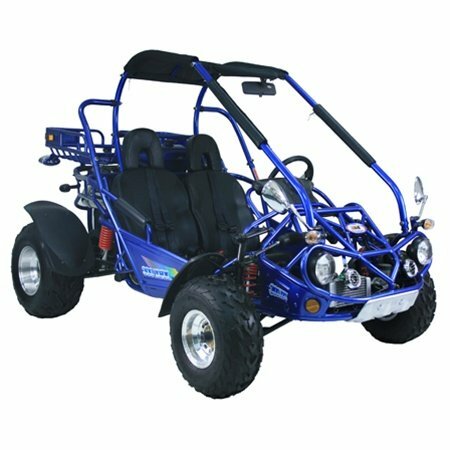 These are just one of the features that make the go-kart ideal for an outdoor type of people. Governor needs to be adjusted for faster speed. 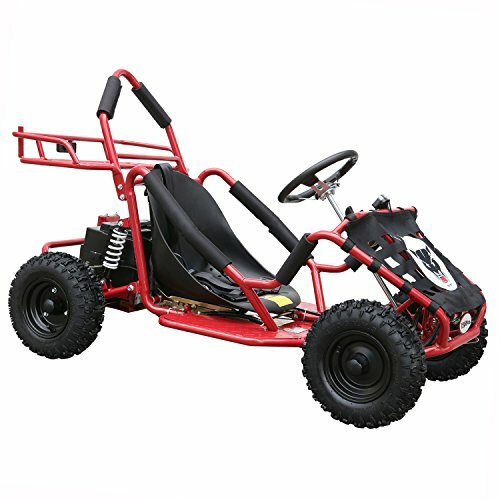 Another sleek design for your selection is the heavy duty constructed go-kart by Coleman. Just like the rest of their products, it provides plenty of power. This single-seated off-road go-kart utilizes an 89cc engine that allows you to use it for the entire day. For safety purposes, a bolstered seat is equipped with a four-point safety harness to ensure that the ride is locked behind the wheel. It also features a heavy-duty roll cage for added security. A kill switch makes it easier to switch it on and off. 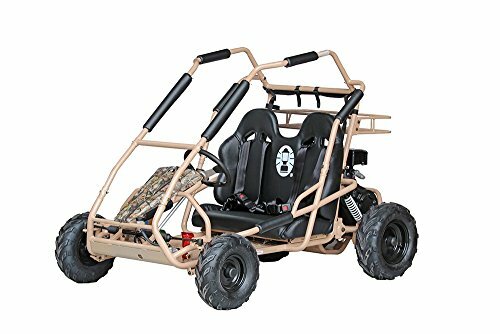 This go kart is specially made for tough people looking for a real adventure. The heavy-duty 16-and13-gauge tubular construction is enough to drive you along the dusty roads of your country. It’s a huge robust machine that will soon provide several years of fun and excitement in the long run. Not suitable for people who opt for speedy karts. If you want a go-kart with extensive color selections, then you should check out the Kandi go-karts. It is one of the hottest trends in the market because it is made out of heavy gauge steel frame. It also features a full suspension with full front A-arm coil. The go-kart is fueled by the 150CC single cylinder, an air-cooled engine that can withstand karting all day and everyday abuse. For added safety, a 4-point seat harness is installed, and the frame guards are padded as well as the steering wheel. Behind, the seat for the rider is a rear safety net to protect you from any flying objects from behind. A great go kart for your weekend adventure that could last a lifetime in limited use. Can only last for a few hours a day. Enjoy cruising around your lake house with this heavy-duty Electric Go Karts. This 4-wheeler kart is quiet and does not create pollution. It’s a great kart to use for your weekend getaway. The age of the rider must be ten years and older. The 1800w brushless electric motor with hydraulic disc brake runs this robust machine. 3-speed limiter control is installed with an ignition key. There is also a key switch for parental speed control of the kart. Made out of durable tubular steel frame, this can last for a long time under proper care. Also, to protect the rider, a roll bar is installed along with a formed bucket adjustable seat with secured seat belts. Trailmaster 150cc XRX GTS go kart your go-to machine for your adventures. 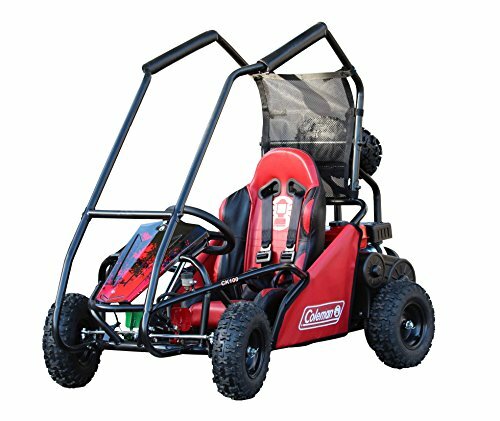 This go kart is powered by a150cc EPA certified engine with a horsepower of 8.2hp/7500 rpm. This single-seated kart is equipped with four-point safety seatbelt to ensure the safety of the user while driving. Aside from that, the steering wheel is adjustable for maximum comfort. Installed with four huge tires, this kart is perfect for a muddy or dusty adventure. The massive wheels are aluminum polished. A fully automated kill switch is installed to ensure the safety of the rider. Maximum capacity of the go-kart is up to 500 lbs. Both kids and parents can enjoy this elegant-looking go-kart and have adventures for many years to come because of its durability. The buyer is given a one-year warranty for this product with no signs of abuse, neglect, or accidents with the kart. This go kart is perfect for regular use. Powered by an EPA certified engine, it can accommodate children of all ages. The maximum speed of the kart is approximately 43.5 mph. It’s an excellent machine for touring around your country or for another kind of adventure. Aside from that, the steering wheel can be adjusted for maximized comfort. You can start the go-kart with its fully automatic kill switch and turn it off with just one click. For added safety, a four-point seatbelt is installed. The heavy duty front and rear shock absorber will ensure that the rider is safe at all times. No manual included for assembly. This automatic go-kart is the perfect machine for a dusty adventure in your town. Powered by a 150cc engine, it can withstand rocky roads and bumps along the way. The engine is certified by the EPA. It’s 100% safe to use and easy to assemble. It features dual wheel drive suspension, independent swing-arm brakes, and the maximum load is up to 500 lbs. The dimensions of the product are 66.1 inches OA x 90.5 x 53.1 x 57.1. The frame is specifically designed to accommodate riders firmly. All metal components are of high-quality. With limited use and proper care, this kart can last for an extended period. Buyer needs to buy an upgraded clutch for a more significant experience. This electric go-kart features a 150cc EPA certified engine. Horsepower is 8.7/7000. Handles are made out of high-quality metals and padded for extra comfort. The frame is made out of finest aluminum steel. This go kart is perfect for kids and adults young at heart. It can be your go-to kart when touring around your neighborhood, fishing by the lake, or having a picnic with your family. Also, for a stylish go-kart, the price is worth it. 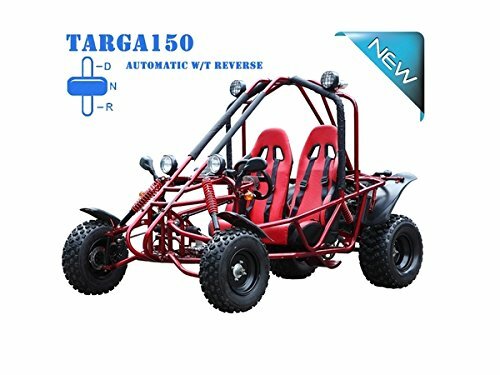 This go kart is specifically designed to climb hilly parts of the road and withstand bumps along the way. Unclear instructions on the manual. Another go-kart from the Kandi company, this automatic kart is equipped with a GY6 engine with reverse. It has CVT transmission and can accommodate two adults inside. It has a rearview mirror for greater control and two bolstered seats. An engine kill switch is also installed for easy turning on and off of the kart. The dimension of the product is 96 x 59 x 61. 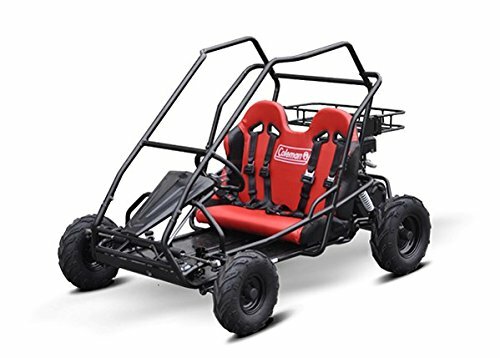 This model is perfect for parents who wanted to teach their children how to drive a kart because of the spacious interior. Expert mechanical skills required for assembly. Coleman prides its company for another go-kart that features a 196cc engine with 6.5 horsepower. To operate, pull start, and the rider will gain full control of the kart. It has rack and pinion steering with hydraulic disc brakes. The roll cage is padded for extra comfort. This go kart is fully automated; it will not be hard for kids to learn how to operate it in just a short amount of time. For safety purposes, the bolstered seat is equipped with four-point hardness. The powerful engine will allow the rider to use it all throughout the day for many years to come. Clutch needs to be upgraded for a better experience. 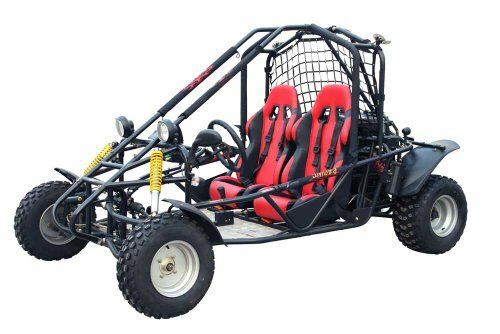 Whether you’re interested in learning how to drive an off-road go-kart, planning to have fun with your family and friends, or simply use it as means of transportation, off-road go-kart is always a good choice. You might want to buy an off-road go-kart that can last for years to come. 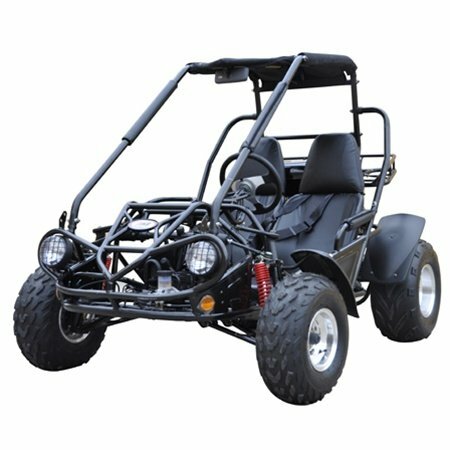 Take a good look at the chassis and body of the off-road go-kart that you are planning to buy. We encourage you to purchase models made of quality aluminum or any metal material. Even if you are buying go-kart for your kids, you should avoid models that are mostly composed of plastic materials. Regardless of the terrain that you are planning to use your go-kart, a model made of quality and durable materials will ensure your safety. No matter how hilly, how rocky, or even sandy the terrain could be, a well-constructed go-kart will enable you to ride and avoid potential accidents. In this case, the age and level of experience of the driver will matter. For instance, if you are planning to use your go-kart on a murky, rocky ground, choosing a model that offers the maximum speed might not be a good idea and can even lead to an accident when things get out of control. If, for instance, you are a father shopping for go-kart for your kids, we highly suggest that you opt for models that offer minimum speed as much as possible. Do not think that a go-kart with a slower speed can ruin the fun when go-karting. In fact, you can enjoy every minute of go-karting if you’re not constantly worried about your safety due to go-kart’s super fast speed. The design of the go-kart is not limited to aesthetic purposes only. Sure enough, it’d be swell if you have a sleek-looking go-kart. But you must make sure that the design of the kart does not compromise the safety of the driver. Always keep in mind that a good go-kart design is the one that shields both the chassis and the body’s cover properly. There are innovative designs of go-karts where aesthetics and functionality are combined. It is best to ensure that the design also follows strict global standards to ensure safety when driving. After the design had been considered, proceed to selecting the source of power for your off-road go-kart. In this case, you have two options: (1) models of go-karts that rely on battery power and (2) go-karts that uses gas to operate. The advantage of using a battery is that compared to gas, it is lightweight and eco-friendly. It makes the go-kart moves a little faster, too. On the other side, go-karts fueled with a gas can function for the entire day compared to battery-operated go-karts that can only last for half a day. Make sure that you choose what is most convenient for your situation. Most models of off-road go-karts can only accommodate two passengers at a time—mostly, the father and son. Following the recommended capacity of the off-road go-kart is essential, as it can decrease the risk of accidents when driving. However, in other models with large designs, it can accommodate up to four passengers at a time. But it is best to keep in mind that the bigger the go-kart is, the higher the cost would be as well. Therefore, it is important to consider the primary objective of buying the go-kart. If you, as a father, is trying to train your son, it is best to opt for a two-person go-kart. But if you want to use it for your family, then you can also choose a bigger and broader go-kart.